On your next cruise, you’re going to splurge. For the next one, it’ll be a suite … with a butler. What is it, exactly, that makes that single word so magical? “Butler.” The word alone, more than almost any other in the cruise lexicon, conjures notions of pampering, swanky accommodations, and service fit for royalty. Butler service is offered on certain ships in the most deluxe accommodations (or, in the case of Azamara, in every cabin from smallest inside to largest suite). And its popularity has been steadily growing—not just on cruise lines that are classified as luxury, but also on mass-market and premium lines. Mainstream lines Costa, MSC Cruises, NCL, and P&O Cruises now feature butler service in their top suites. On the other hand, some lines you’d expect to employ butlers—like luxury line Seabourn and premium line Holland America—don’t have any at all. “…To his satisfaction.” That comment is actually quite telling. Butlers are the creme de la creme of a ship’s hotel staff. While most are culled from the ranks of room stewards and dining room staff because of their front-line training in service and high rates of passenger satisfaction, some cruise lines actively solicit trained butlers for their ships. (I found ads online for experienced butlers for Oceania and Celebrity.) While most are trained by the cruise line, some are schooled at specific butler academies; those on Silversea and Regent Seven Seas, for example, come from the Guild of Professional English Butlers, which provides service to members of royal families around the world. And while some are quite formal, not all come from the stiff-upper-lip Jeeves tradition of butlering. Some are female! And some are quite jovial and fun, getting on the floor to play with the kids or whimsically decorating a room for a special occasion. 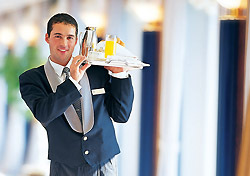 Ultimately, the increase in popularity of butler service stems from the growing “comfort culture;” guests who travel in deluxe accommodations are paying for extra space, extra services, extra attention ,and pampering, and they don’t want to worry about little time-consuming details like dinner reservations, dry cleaning, and private shore excursion arrangements. I also discovered that there is little difference in service between big ships and smaller ships: Butler service on large ships adds an element of luxury for those guests who don’t want to travel on smaller ships, and guests on smaller ships get that extra layer of personalized service when they choose a suite with a butler. Not all butler services are equal, so check out our line-by-line guide. Who Gets It: Every passenger on Azamara Journey and Azamara Quest. What They Do: Your butler will set up in-room cocktail parties, deliver and serve meals course-by-course, make your spa and specialty dining reservations for you, and arrange to get your laundry cleaned and pressed. Afternoon tea is served on a cart that goes door to door. Get This: Your butler is also your room steward. I wonder: When do they find the time to make up your room and perform all of these special tasks? Frankly, the reviews have been mixed, with many Cruise Critic members saying the butlers are little more than room stewards in different attire. Who Gets It: Passengers entitled to butler service are those booked in Celebrity Cruises’ various suites (depending on ship, they include Penthouse, Royal, Celebrity, Century, and Sky). What They Do: Celebrity offers its exclusive “European Butler Service,” which includes assistance with unpacking/packing, daily news delivery, full breakfast, in-suite lunch and dinner service (including a restaurant meal served on your balcony, course-by-course), in-suite afternoon tea service, daily evening hors d’oeuvres, complimentary espresso and cappuccino, shoe-shine service, and delivery of requested board games. Butlers will even arrange a private party in your suite, then clean up afterward. Butlers come to Celebrity in a variety of ways; some have risen up the ranks of the hotel staff and some are recruited by outside agencies, but all go through Celebrity’s training program. Get This: Cruise Critic member Alaska Boo took her office staff on a cruise as a “firm retreat.” They booked a Royal Suite on Celebrity Summit and enjoyed the private verandah hot tub … au naturel. They got their butler Peter to bring them drinks and even take a photo of them (three women) enjoying this most exquisite perk; they were, according to Alaska Boo, properly covered with bubbles. Who Gets It: Anyone who books a suite—except for mini-suites on Europe sailings—is entitled to butler services. This includes the new Samsara Spa Suites on Costa Concordia, Costa Serena, Costa Pacifica, and Costa Luminosa. What They Do: On Costa Cruises, butlers offer a pillow menu and provide the selected pillows; they’ll unpack and arrange clothing if the passenger desires; repack at the end of the cruise; make all reservations including shore excursion, spa and specialty restaurants; shine shoes; and organize all details, including service, should you want an in-suite cocktail party. In addition, your butler will leave a daily menu of the restaurant offerings, and you can choose to dine in-suite with course-by-course service from the restaurant. Get This: Costa’s butlers are handpicked from exceptional personnel already on staff and go through formal training with the company. Who Gets It: Passengers who book cabins in categories PH (Penthouse), PS (Penthouse Suite), and CP (Crystal Penthouse) on both Crystal Serenity and Crystal Symphony. What They Do: Butlers on Crystal Cruises’ ships typically serve as your manservant, and if you’ve ever had one, you’ll revel in the fact that they’ll handle your dry cleaning, proffer gourmet snacks at tea time (there’s a menu every day, but you can always get caviar), and make dinner, spa, and shore excursion reservations. Once you’ve ordered room service from the dining room (breakfast, lunch, or dinner) and had it served by your butler course-by-course at your leisure, you’ll be spoiled forever. Get This: I have sailed with butlers on Crystal Symphony and Crystal Serenity and was pleasantly surprised to learn that in both cases, each had risen from more junior posts on the ships—and had worked onboard for at least five years apiece. Best of All: My butler on Crystal Serenity surprised me with the news that I could order room service off the menus of the ship’s oft-overbooked Prego and Jade alternative restaurants (and was able to get us tables on otherwise full nights besides)! He also was a great source of information about ports of call and delivered a few delish tidbits about life onboard (I promised not to tell). Who Gets It: On Queen Mary 2 (QM2) and Queen Victoria, all passengers in Queens Grill (Q4 – Q1) suites get butler service. What They Do: Butlers have been in service for Cunard since the original Queen, the Queen Mary (1936). Today’s butlers are unobtrusive and available to the passengers for every service imaginable, including in-room dining, packing, and unpacking. They are trained in Cunard’s signature White Star Service and are selected from the steward staff based on exemplary service. Who Gets It: Butler service is available to passengers staying on the Penthouse Deck, Europa only. What They Do: Among other services, the butler will unpack and pack your luggage, serve beverages and food in your suite, see that your clothes are pressed, arrange for in-suite cocktail parties, make spa reservations, and generally enhance your experience with unobtrusive service. Get This: Most of Europa’s exquisitely trained staff speak English, but unless you are on one of the ship’s “bilingual” cruises, expect all announcements and daily newsletters to be in German. With luck, your butler can also provide translation. Who Gets It: Passengers staying in MSC Fantasia and MSC Splendida’s Yacht Club Suites have butler service. What They Do: Butler duties include assisting passengers at check-in, overseeing the transport of luggage, unpacking, and serving traditional English tea from 5 p.m. In addition, the butler can arrange for cigars, wine, liquors, and Champagne, and pre-book tables in the restaurants, spa treatments in the Aurea Spa, ad hoc excursions chosen by the guest, and even private parties in the suite. Get This: Somewhat disappointingly, course-by-course dinner is not available—a given on more upscale ships. Suite guests are limited to dining off of the room service menu. Who Gets It: Passengers in Penthouse Suites (AE) and above are entitled to butler service; the Garden Villas (available on Norwegian Jade, Norwegian Dawn, Norwegian Pearl, Norwegian Gem, and Norwegian Jewel) have dedicated butlers. What They Do: Butlers are on call 24 hours a day to “expedite top suite guest requests.” Their duties include assisting passengers with unpacking and repacking garments; expediting laundry, dry cleaning, and pressing services; delivering liquor, wine, and beverages; delivering DVDs and CDs; filling/emptying hot tubs; and providing shoe shine service. NCL’s butlers also help with delivery of flowers, personalized letters, and stationery on embarkation day and during the cruise. They serve Champagne; provide warm face towels and canapes on embarkation day to Garden Villa and Owner Suite passengers; ensure that fresh flowers, fruit baskets, sodas, water, newspapers, and other amenities are set up properly and changed/replaced as needed; set up private cocktail parties en-suite; and take food orders and serve in-room breakfast, lunch, afternoon tea, and dinner from any menu onboard including the alternative dining venues. Get This: Butlers on NCL ships are culled from the rank and file of the hotel department based on their excellent customer service and positive consumer feedback. As a result, NCL’s butlers retain a level of warmth and a service ethic that’s hard to find on any other cruise line. Butler service on a Freestyle ship can make the big-ship cruising experience intimate, cozy, and special. Who Gets It: Butlers are available in Owner’s Suites, Vista Suites and Penthouse Suites on all three Oceania ships (Regatta, Insignia and Nautica). What They Do: Butlers act as a “personal concierge” or assistant to the guests, performing such duties as unpacking, arranging dry-cleaning, organizing private in-suite parties, and handling reservations for spa services, alternate dining reservations, shore tours, and private cars. They deliver canapes and afternoon tea, and can serve meals from any of the restaurants in-suite, course-by-course. Butlers will even draw you a lavender bath. They handle every detail from embarkation to in-suite checkout at the end of the voyage. Get This: Oceania selects its butlers from a variety of sources including fine hotels ashore and the ranks of its hotel staff. All are trained in the in-house “Signature Service” program, developed specifically for Oceania by a leading hospitality consultancy. Who Gets It: The two penthouses on Aurora; as well as “A” grade cabins on Aurora, Oceana, and Oriana, have a shared butler in addition to the cabin steward/-ess. On Ventura, butlers are provided in the Ventura Suites and family suites. What They Do: Butlers provides a wide range of services including unpacking your luggage and serving meals in your suite/cabin, if required. They will draw a bath, deliver flowers when ordered, make spa reservations, and take care of special services that you might request. Get This: P&O Cruises, which used to be a division of Princess Cruises and is still closely aligned with the U.S.-based line, is very British and much more formal than Princess, which does not offer butler service to its guests in even the most elaborate of suites. Who Gets It: Anyone booked into a Penthouse Suite (category B) or above gets butler service. What They Do: Regent Seven Seas butlers arrange private parties; make reservations for Signatures (the alternative restaurant); arrange for shore excursions; assist with laundry, dry-cleaning, and pressing; and serve meals course-by-course from the restaurant menus. Get This: Regent Seven Seas Cruises is the first cruise line to enjoy membership in the Guild of Professional English Butlers, which trains butlers for service to Britain’s royal family and other royals around the world. Best of All: Our butler on Seven Seas Navigator made sure my mother’s Bombay Sapphire gin was always cold, that there were always olives in the fridge, and made her very first “dirty martini.” He brought us coffee, croissants, and juice at a set time every morning, served our in-suite meal course-by-course, and only brought the ice cream and coffee after everything else was cleared up. When a flower in our vase drooped, he replaced it. He pampered my mother to perfection, which was exactly what I wanted. Who Gets It: As of June 2009, passengers staying in the Grand, Royal, Rosselini, Owner’s, Silver, and Medallion Suites on five Silversea ships (Silver Shadow, Silver Whisper, Silver Cloud, Silver Wind, and the expedition-going Prince Albert II) are entitled to private butler service. Over the course of 2009, the line will be adding butler service to every stateroom. What They Do: Silversea butlers are available to facilitate every aspect of the passenger’s cruise experience, including unpacking and packing clothing, making reservations at the alternative restaurant, arranging a private car at the next port, drawing a bubble bath, and orchestrating an elegant in-suite cocktail party.